At around 4:39 p.m, on Monday, August 22, Hillsborough County Fire Rescue received a call to respond to a school bus fire at the intersection of FishHwak Boulevard and Bell Shoals Road in Riverview. 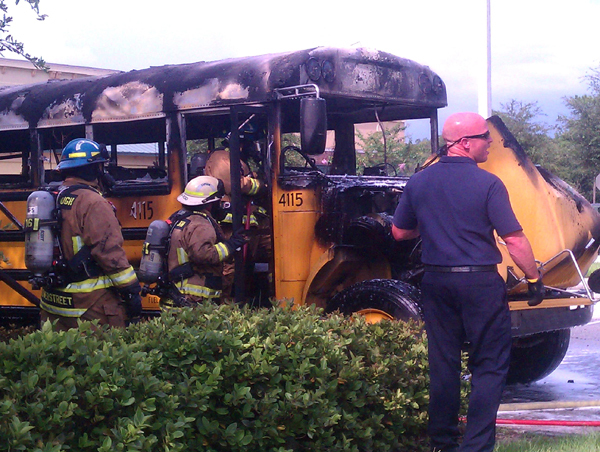 At around 4:39 p.m, on Monday, August 22, Hillsborough County Fire Rescue received a call to respond to a school bus fire at the intersection of FishHawk Boulevard and Bell Shoals Road in Riverview. According to a school spokesman the driver of the Hillsborough County school bus #4115 was conducting a “dry run” day before the first day of school when the bus caught on fire. Up on arrival to the scene Fire Rescue found the bus completely engulfed in flames, which was quickly put out. The bus driver was not hurt and since it was a practice run there were no students on the bus.